When I decided to blog about my experiences as a first time mother to twins, I tried to define the goals of my blogging. I wanted my blog to be a source of decent information and tips for any mother-to-be. I promised myself that I will not stray from my lofty goals. Great aspirations except (like anyone in the vicinity of a baby will tell you), bodily fluids are a big part of motherhood and sooner or later - no matter how hard you try - you're gonna end up making some reference to bodily fluids on your blog. "Where are your favorite black pants mummy?" "Well baby, I took them to the drycleaners to get rid of the snot + peas mix that you generously spat at me last week instead of just saying you were done"
"But mummy, you can still wear your nice blouse!" "No honey, I can't. Umm, remember when I gave y'alls the egg yolk in the morning?" "Yets mommy, I didn't really wike it"
"I know dear, but Sugar did. She really wiked it. And she ate it. And she gave it back to mommy in the evening. Like a picasso painting on my blouse"
So yes, I have tried to do it with a delicate hand but it had to be done. I have become another mommy blogger posting about poop, pee and other bodily fluids that babies are so generously endowed with. Preparation - Use the freezer aisle of the grocery store. Just because it's homemade baby food doesn't mean it has to be made from scratch. This works especially well for peas. I recently bought a big bag of organic frozen veggies from Costco to make into puree. Treats and bribes - They are nights when Spice is too tired to want to eat. (She's more of a big breakfast lady). On those nights I give her frozen pureed fruits or yoghurt in a mesh feeder. She loves it. She's never too tired to eat that and it means she still gets dinner so works for me. There you have it. Those are some of the tricks that stop me from falling off the wagon of making my own baby food. When I was younger, I used to have a theory that everyone thought their mother's cooking was the best. I'm no Paula Deen in the kitchen so one of the things I've been looking forward to with my children is hearing them boast about my cooking "My mom makes the best boiled eggs ever!". Tell it like it is baby. My dreams got an uppercut in the chin yesterday. You know I've been making baby food for the girls to take to daycare. The normal schedule is 3-4oz in the morning and 2-3oz for lunch. However, I did have a small stockpile of commercial baby food which I decided to use up. With that in mind, each girl took a 4oz pouch of breakfast baby food and a 4oz jar of lunch baby food to daycare yesterday. I included a note telling their care provider that they would only take 2oz from the jar and to store the leftovers in the refrigerator. You can only imagine my shock when I picked them up and was informed that they not only ate everything up, they seemed to want more. Are these girls trying to tell me that Earth's Best Spinach and Potatoes tastes better than mommy's chicken with peas, carrots, corn and green beans? Did they get the memo of loving mommy's cooking? Is this a male thing - this love for mommy's cooking? Because if it is, I'm going to get me a son or two because I'm not going down like this! PS: In revenge I gave them jarred carrot and tomatoes for today's lunch. Let's see how you like that girls! I'm messing with the idea of moving the girls to their convertible seats soon - still rear facing. They have not outgrown their infant seats yet but I have just one base for each seat. Instead of buying spare bases, why not just buy the next seats and keep them is Daddy's car so in case of an emergency, both cars are equipped to carry the babies. 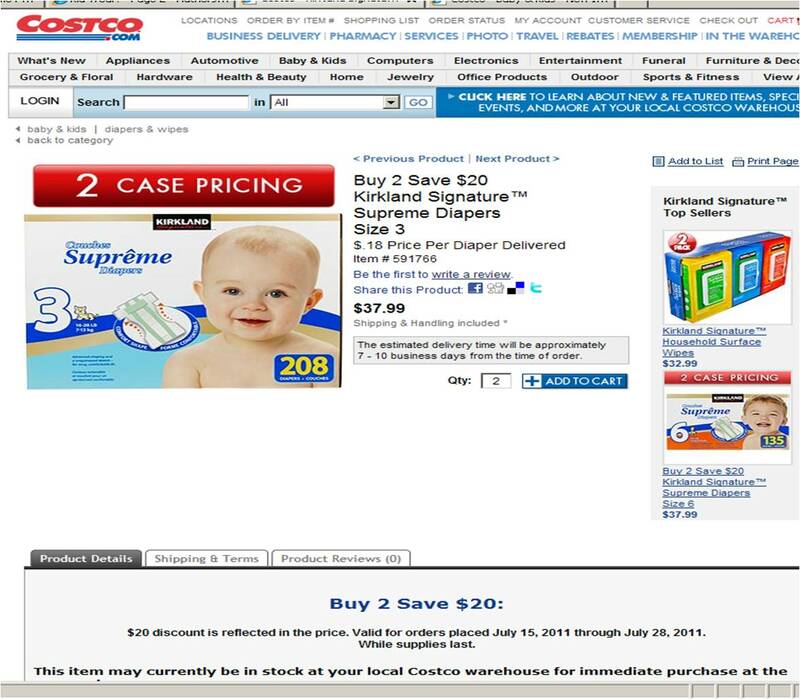 You can't buy diapers any cheaper than that. 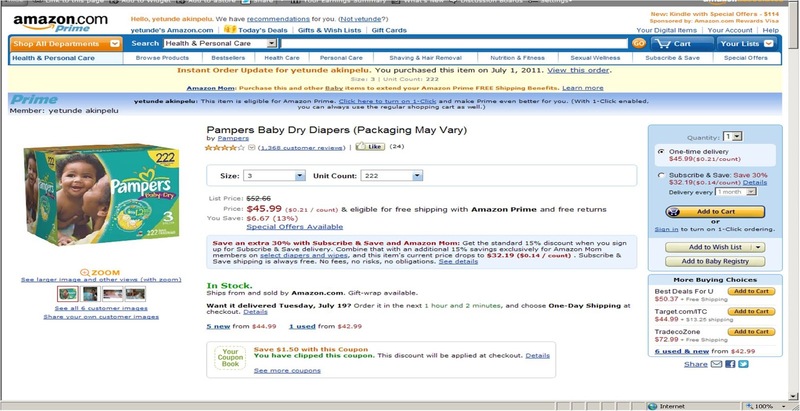 If you have twins or just need to save money on bulk diapers, I recommend buying from Amazon . 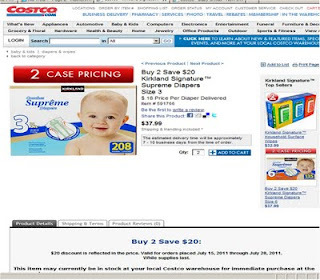 You can click on the picture in the sidebar to join the Amazon Mom program and get special discounts on diapers and baby care items. First weekend in cloth diapers ended with tell-tale redness in Spice's diaper area for the first time ever. Granted, it could have been a coincidence, it could have been the tomato or mango baby food but still, it happened. First Saturday in diapers, Daddy said "Are these the nappies you were talking about" Me:"Yes" Daddy: "It makes them look like bugs". Me: "Bugs as in flies and spiders?" Daddy: "No. As in bugs with big backs". Okaaaay! Honestly, cloth diapers are not comparable alternative to disposables and that's just it. It actually took using cloth diapers to make me appreciate the depth of technology that has gone into making disposables as trim, absorbent and dry as they are. The chemical engineer in me tips off her hat. I feel so un-green and un-crunchy writing this post, but I can't help it: Cloth diapers are not for me right now. I still reserve the right to change my mind in the future though. No major change to the schedule except the girls are sleeping longer before waking up for their early morning bottle now around 6am. Breakfast is still 4oz of solids at 8:30am in the daycare. Lunch is 8oz bottle of formula followed by 2-3oz of chicken and veggies around 1130. Afternoon snack is a 8oz bottle at 330 PM and dinner is 8oz bottle plus 1oz solids at 600pm. This is the month I introduced the girls to proteins - yoghurt, egg yolk, chicken and spices. I confess, the chicken is the only protein I'm feeling right now. The yoghurt seems to give Sugar excessive BM. For the coming month, I'm planning to introduce them to Nigerian foods and flavours and lumpier textures. Orthodontic pacifiers that glow in the dark - What would mama do without these? I've always wanted twins (triplets actually but when I came to the US and saw how fearsome kiddie tantrums can be, I dropped my expectations a notch). I dreamt of having identical twins who would be polar opposites personality-wise or fraternal twins who would be extremely similar personality-wise. As luck will have it, I have neither. I have fraternal twins who are really, really different in patterns and behaviour and the analytical part of me just takes a lot of delight in their differences despite emerging from the same DNA pool. So what am I going to wax lyrical about today? It's the subject of motion or rather attempts at motion. The girls are both at the stage where they are very mobile without actually being able to crawl or walk. On the one hand, there's Spice - she's my rolling baby. She can roll her way from San Fransisco to Atlanta with a stop in Detroit without batting an eyelid. Seriously! The child is so comfortable getting around by rolling that I suspect she's going to skip the crawling phase and just start walking. Then there's my rocker baby. Ms Sugar has finally figured out the business of getting on all fours. All well and good except she doesn't know what to do next to get her little body to move. Her mind (and grunts) are willing her body to move but all she gets is a rocking on the spot motion and no actual movement. So yes, until something changes, I have rock and roll babies in the house. Let's start from the beginning shall we. At my first visit to the pediatrician, I asked about giving the girls bottled water and he nixed that idea and recommended "distilled water". My sister (who happens to be a pediatrician too - shout out sis, muaaah!) also talked up nursery water. That's how I found myself lugging gallons of distilled water every other day from store to car and up the stairs to house. I have since used the following brands - Nursery water, Gerber and Walmart's. As the girls are clocking 8 months, I've been considering making a switch to boiled and filtered tap water but I'd also heard some rumblings about fluoride so I need to put on my researcher's cap. What if the drinking water has fluoride? According to the dentists and pediatricians, it increases the risk of enamel fluorosis. This applies to babies taking their formula in the form of powder plus water. Here's the kicker - Nursery water has added fluoride but Gerber and Walmart's Great Value water do not. What does this mean to me? Well, if there was an issue with fluoride supplemented water for babies under 6 months old, I've already passed that stage and yes my girls have had a LOT of Nursery water. I am going to have faith that if it was a big deal, the FDA would have said something right? I hope so. The CDC recommendation is a tolerable daily upper limit of 0.7mg of fluoride for babies under 16lbs/6months. Skating the edge a little wouldn't you say? The summary? 1-I am switching to filtered and boiled tap water after I check the stats on my county's water supply. 2-An educated parent is a child's second most valuable safety net (the first of course is the covering grace of God). 3-I ain't a doctor. 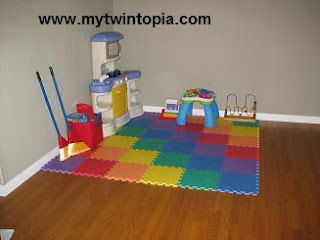 The typical playpens are too small for two babies or toddlers to play in. If you're looking for the best play pen or play area for your twins, you have to be innovative. This is what I recommend. Rainbow Interlocking Foam Mats : These were the thickest foam mats I could find and I also like the lack of any specific cartoon character. I emphasize the thickness because a playmat that's too thin will not adequately cushion the baby from trips and falls. These ones made by eWonderWorld are over half an inch in thickness and I've been using them for over two years. The foam is still firm and it's in like-new condition. Definitely a well-made and long-lasting foam mat. As the twins grow older, the gate can be used to cordon off areas of the house you would like to keep them out of e.g around the television or Christmas tree. You can then switch to an arrangement similar to the one shown below. 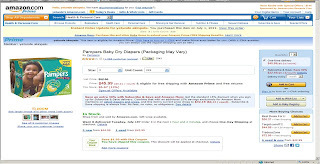 All the items listed above can be purchased from Amazon.com by clicking here. I maintained a feeding log for my twin girls schedule from when they were a month old till around 4 months old. I used the Baby ESP app (the only app I've ever paid for)and I also used a modified paper version of this log (yes, I designed my own excel spreadsheet). Babies know how much food they need in a day and they WILL get it. With the schedules, I noticed that within a 24 hour period and without fail, the girls always ate the same volume. They were accurate to the ounce. When they wanted 24oz of milk, they got it. It didn't matter if it was 12 bottles of 2oz or 6 bottles of 4oz; so I always aimed at increasing their bottles to whatever holds their tummys for 3-4 hours. That's how we went from 8 bottles every 3 hours to 4 bottles every 3-4 waking hours. From #3, I figured that when my babies start waking up at night and not back to sleep an hour later and are fussy even with a pacifier on hand, they're hungry. I feed them and I also realise that it's time to increase the daytime calories again. Why am I posting about this? Well, both girls have been living up to #4 now so I know it's time to get some more solids in those little tummys so mommy can get some semi-interrupted sleep. Please note that this is what I've observed from my babies. All babies are different so... that's my disclaimer right there. So, we finally took our first vacation as a family of four. I looked forward to it with a mixture of anticipation and trepidation. Both feelings were justified. Here's a recap of the good, the bad and the ugly sides of our first family vacation with twins. Making the hotel booking online and then calling the reservation manager of the hotel to request two cribs. I actually called to change our booking from one night to two. I had originally booked a suite but for two nights, we could only afford a double room so that's what we changed to. During the conversation, I mentioned to the manager that I needed two cribs as I had twins. Buying and packing my own pack n play sheets. Getting an upgrade from our hotel without asking. They kept us in the junior suite for the price of the double room. Awesome. Going to Seaworld with our stroller. Everytime we stroller-parked, I had nightmares of not finding the stroller when we got back. Next time, a $20 umbrella stroller is the place to go. Driving back in the daytime. Babies have limited tolerance for car confinement. Our adoring aunty was kind enough to nominate us for Best Parenting blog. Would you be kind enough to vote for us here. Thank you and muuuah! Our adoring aunty nominated us for Best Parenting blog by a Nigerian. Please vote for us here. Thank you and muuuah!